An island distillery is marking a year in business, having already exported around the world and created jobs. Husband and wife Michael and Katie Morrison established the Isle of Barra Distillers in 2016 but have only sold their product since August 2017. They said that since the gin went on the market they have been inundated with sales. Their website crashed on the first night due to high demand. Barra gin was also put in the global spotlight when it became a headline sponsor at London Fashion week for designer John Smedley. Mr Morrison said he attributes part of the firm’s success to not using a UK distributor but doing it all themselves. He said he believed it was a “bold move which worked out well” because Barra gin is now stocked in more than 200 UK restaurants, hotels and bars. These venues include Tom Kitchin’s Michelin-starred restaurant The Kitchin and its sister restaurants The Scran & Scallie and The Castle Terrace. Despite the success of 2017 Mr Morrison said the real highlights were this year. 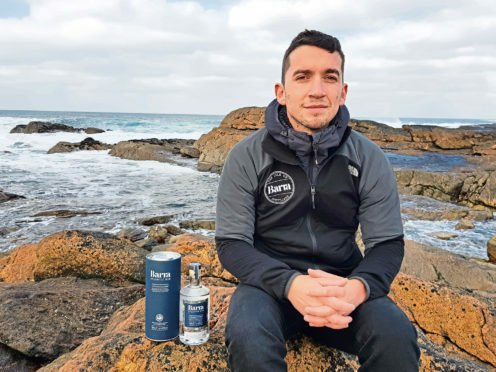 He said: “In mid-March the Isle of Barra Distillers agreed a distribution deal for exporting the island spirit into Denmark, the first country outwith the UK to have the Barra gin available to buy. “This was a real high point for everyone involved. “Then, just as early as last week, we signed the second distribution deal, this time with an importer in Germany. It had been an incredible year for everyone involved, he said, and he was delighted to have created more jobs on the island. He said: “We set out to create something a bit different and wanted to grow at a pace that we could adjust to as time went by. “But from day one it has been unbelievable. We’re very excited for the future. “Creating employment was one of our key goals and we have done that by adding three new opportunities into what can only be described as a fragile island economy and as we grow so will the opportunities for further employment. “My personal highlight is of course exporting our island spirt and story to our friends in Denmark and Germany. To do this in year one really is fantastic.